Ubisoft's well known Rayman series officially named as a Wii (formerly Revolution) launch title. Ubisoft today announce that their upcoming Rayman title, Rayman Raving Rabbids has officially been named as a Wii launch title. "Scheduled for current and next-generation video game consoles, Rayman Raving Rabbids™ also joins the line-up as an official launch title for Nintendo’s Wii™, formerly known as Nintendo’s Revolution gaming system, and its innovative controller. 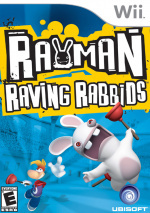 Rayman Raving Rabbids™ is being developed by Ubisoft’s award-winning studio in Montpellier, France led by Michel Ancel, creator of the original Rayman game, the critically acclaimed Beyond Good &amp; Evil™ and Peter Jackson’s King Kong: The Official Game of the Movie." We'll be expecting more information and screenshots from the game as the months roll by prior to launch.